There are three main types of damp you’ll find in residential buildings; rising damp, penetrating damp and dampness caused by condensation. Condensation is most common, mainly due to a lack of ventilation in modern day “airtight” buildings, followed by penetrating damp that is common where plumbing leaks, poor guttering, poor roofing and poor rendering exists. Rising damp is often seen in London or older buildings that are lacking a damp-proof membrane, or where the membrane has become damaged over time. It can also be seen in buildings where surrounding dirt or soil has risen up against the wall, bypassing (bridging) the damp proofing course. Rising damp treatment requires a new physical or chemical damp proof course (DPC) to be installed 150+mm above the external ground level. The chemical DPC involves injecting a specialised cream into the mortar bed/s or bricks in a continuous unbroken line. This lines the pores of the material preventing the groundwater from rising. 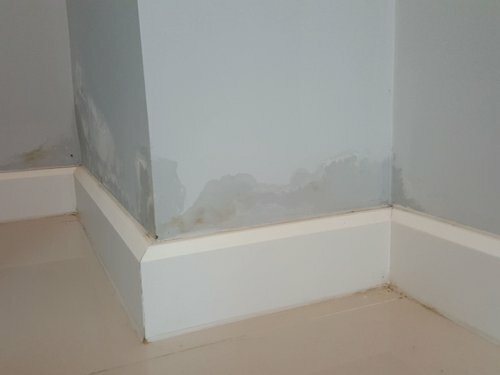 Rising damp is often invisible to the eye, but can be recognised by “tide marks” that occur on internal walls up to the point moisture has reached. Often reaching up to 1 metre above the skirting board, rising damp will only very rarely occur above this point. While isolated damp patches will never occur more than 1.5 metres above the skirting board from this kind of affliction. On the affected internal wall, you are likely to see dusty white deposits, this is caused by sulphates that have dissolved by groundwater and dry out on the surface. More worrying, hygroscopic salts (nitrates and chlorides) also get pulled up in the water solution and while you may not see these type of salts, they continue to draw more moisture until treated. The most common indication of rising damp comes from the degraded state of lower walls and skirting boards as the wood and plaster rots and starts to crumble. You may also see paint and wallpaper starting to flake and pull away from the wall. It’s quite unsightly and left untreated can cause structural issues over time. 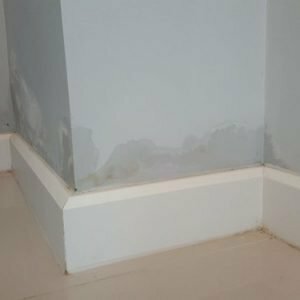 Rising damp is the result of capillary action in porous construction material, where groundwater is able to bypass the damp proofing membrane or there is no/old/damaged damp proof course in place. You can generally distinguish rising damp from damp caused by condensation by measuring the moisture level within the wall. Condensation forms on the exterior of walls and windows and rarely penetrates into the brick. Rising damp should be treated as soon as formal identification has been made by a professional contractor or damp surveyor. If left untreated, rising damp can cause further problems in the property. If you suspect rising damp in your London property, contact our team today on 0208 535 7536 for a free survey.